Uploading your images (that is, adding) means getting the digital images from your hard drive into your online photo albums on ImageEvent's Web Site. Your digital images must be saved in a supported file type such as jpeg (jpg). You may also choose to email your images to your album. If you have a digital camera or digital camcorder, use the software provided with your camera to transfer it to your local hard drive. If you have a scanner, scan your pictures and save themto your local hard drive. Before you start uploading your images, you must first create an album. ImageEvent supports file types. More types are always being added. Optionally, you may upload a ZIP file containing images and videos. We recommend you to convert your images to JPEG if your images do not display correctly. You may also upload one zip file compressed of all your images. You can put all your jpegs in a zip file and then upload it. After the zip file is uploaded, all your files will be automatically uncompressed and be put in your album. This saves you time by not having the select each image one by one when using Easy Upload. Upload limits. The maximum to upload at one time with "Easy Upload" is 50 images. The maximum to upload at one time with "Mega Upload" is unlimited. "FTP Upload" has no limits on the transfer size. You may upload your images in consequtive transfers. The limit for total transfer size at one time is 2GB. The maximum file size each images is 20MB for premium members and 5MB for trial members. Large file support may be purchased to upload images up to 200MB each. Easy Upload is the easy way to upload images. It consists of a Browse button where you can add multiple images. It easy to upload all if your photos at once. A progress bar will show you details of the upload. There is no limit of how many you can transfer at once. Select number of images. (Optional) Use pull-down menu & select about the number of images to upload. Select up to 50. Browse for images. Use "Browse" to select each image. Use "Preview" to preview the selected image. Start your upload. When ready, "Start Upload" to start transferring. It is best to close all your programs before you start your upload. The pages will refresh the status as the upload is in progress so please do not close the browser windows. Click "Refresh" if upload status stops refreshing. Mega Upload is powerful & easy. It is a plug-in that runs seamlessly in your browser. Install control by granting permissions. Select multiple files and add by dragging to bottom pane. There is no limit on how much you can transfer at once. Platforms: Windows, Mac OSX, and Linux. Browse for images. Start here and click Browse-- it opens the file dialog. Use both "Browse" and "Remove" to pick and choose images to upload. Doubleclick directory to change to it. Select multiple files using shift & control keys. Selecting a directory selects all it's images including subdirectories. Preview all images. This is an optional step to preview the selected images. Start Upload. When ready, click "Start Upload" to start transferring. It is best to close all your programs before you start your upload. The pages will refresh the status as the upload is in progress so please do not close the browser windows. Your upload may freeze and possibly stop if your screensaver starts while uploading. Please make sure your screensaver is off. FTP is an powerful way to upload images. Upload with Internet Explorer or use any FTP Client. Drag and drop or use copy and paste command. There are no upload limits and transfer multiple images or directories. 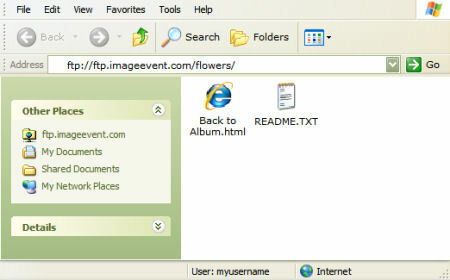 After creating album, click link button in FTP Upload, or type ftp://ftp.imageevent.com in your browser to log in with your username and password. You may be asked to enter your username and password to log in. Open up Windows Explorer as the directions ask. Normally you will need to click on Tools > Open FTP in Windows Explorer. Drag and drop or use copy and paste command the images into the window. 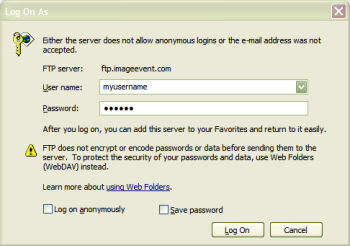 Log in to your FTP Account at ImageEvent. Once logged in, change to album folder. Select Images and then Transfer Upload. FTP Client Software. Download client software for your operating system if you need it. Notes: DSL / Firewall Users: If you are using DSL / Cable Modem / Home Networking, please enable Passive FTP for ftp to work. To enable it for Internet Explorer go to: Tools -> Internet Options -> Advanced. Check "Use Passive FTP (for firewall and DSL compatibility)". Restart Internet Explorer (Better if you reboot your machine). If using an FTP Client, make sure PASV is checked under firewall settings. Internet Explorer needs to enable Folder View for FTP. You will need to access it from Windows Explorer. 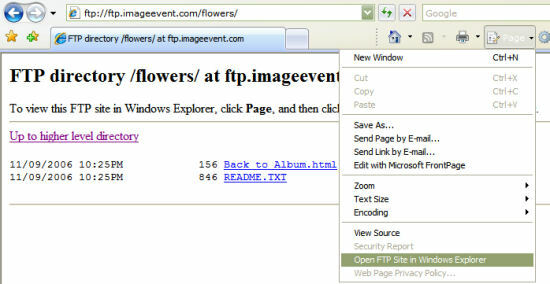 Once you try to access your album to upload via ftp, such as ftp://ftp.imageevent.com/flowers, Internet Explorer will try to display the FTP site in an HTML view. You will want to view the site in folder view, you will need to access it via Windows Explorer using the Page menu item available in Internet Explorer. After you are viewing in FTP in HTML view, click on Page Menu and then Open FTP in Windows Explorer. You will be asked to login. Note: do not check "Save Password"
You should then be logged in your ftp account in folder view. You can go ahead and copy and paste images to the window. You may choose to send your images by email as attachments. Select "Attach File" command on your email program and then attach the photos saved on your computer. Email all types of images including a ZIP files of images. Click "Send" and wait a couple of minutes. You will receive a confirmation email once they are processed. Log in to your account, and click on your "Inbox" album to view the images. Your inbox album is a personal album we generate if it does not exist. All photos that are attached by email appear in this album. You may move your images to a new album or edit this album to change the level of privacy-- this way you can share with friends and family! Due to security reasons, you may only send from the email that appears in your account. If you want to email from a different address than the one you used to create your account, you must go to your Account Settings and update your email address. Once you finish emailing, go back to your Account Settings and change it back. Image Descriptions can be automaticaly generated from the EXIF Image Description. If your software program that you use to organize photo on your PC has support for EXIF Image Description, descriptions can be automatically added to ImageEvent. For instance with Adobe Photoshop(R) Album when you edit the caption, the caption will appear in the description at ImageEvent. AOL Users: It is best to use an external browser rather than the built-in browser. Please use AOL version 6.0 or higher.